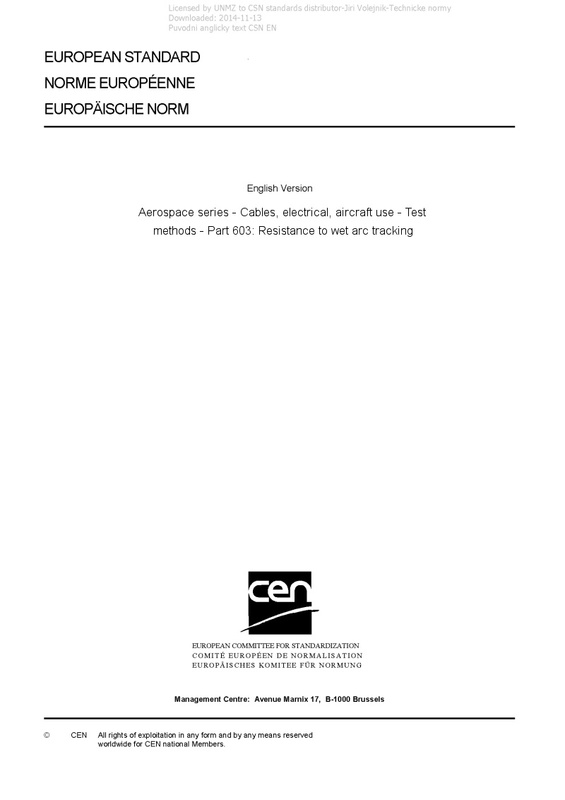 EN 3475-603 Aerospace series - Cables, electrical, aircraft use - Test methods - Part 603: Resistance to wet arc tracking - This European standard specifies a method of assessing the behaviour of cable insulation subject to an electric arc initiated and maintained by contaminating fluid along the surface of the insulation. This standard shall be used together with EN 3475-100. The primary aim of this test is: ? to produce, in a controlled fashion, continuous failure effects, which are representative of those, which may occur in service when a typical cable bundle is damaged and subjected to aqueous fluid contamination. Electrical arcing occurs along the surface of the insulation between damage sites on adjacent cables; and ? to examine the aptitude of the insulation to track, to propagate electric arc to the electrical origin. Originally defined for 115 Vac network, this test also proposes conditions for 230 Vac network. Unless otherwise specified in product standard, only 115 Vac conditions shall be satisfied. Six levels of prospective fault current have been specified for concerned cable sizes (see Clause 7). It is agreed that sizes larger than 051 need not be assessed since the short-circuit phenomenon becomes dominant at low line impedances. Unless otherwise specified in the technical/product standard sizes 002, 006 and 020 cable shall be assessed.